Brown and Ecru series There are 16 products. 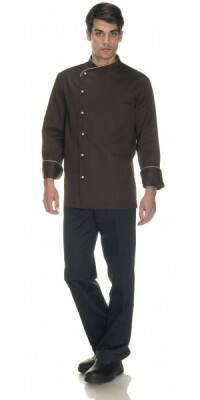 Uniforms for pastry-shops and ice cream shops: discover the style of the Brown and Ecru colour. The elegant main feature of this line of clothes for pastry-shops and ice-cream shops is represented by the combination of the two basic colours: Brown and Ecru. Mixing the garments with accessories of the same colour – or of different matching colours – you can obtain a very captivating and innovative look. Our proposal for men is the elegant Gustavo jacket (most of all for chocolate makers), to which can be combined the Barletta apron; for women we propose Sabrina pinafore, an elegant and practical garment, appreciated for the excellent wearability and the comfort in the movements. As to aprons, we propose two models: Desio apron, a simple unisex apron with bib, and Cesena apron, a women’s apron with a more refined style, similar to the pinafore. To complete the uniforms, here are our two hats: Agnese pillbox hat and, for the most brilliant guys, Gatsby flat cap. All garments of this line of clothes for pastry shops and ice cream shops are made of Soft-feel gabardine, a light mixed-blend fabric (50% cotton, 50% pol.) that ensures comfort and freshness and, at the same time, a great resistance while washing and to wear. 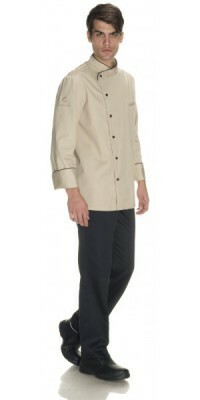 Men's Jacket with side buttoning, model Gustavo Brown colour with Ecru profile on collar and cuffs Ecru pull-out buttons Immediately available for delivery: sizes from S to XL Made of Lightweight Soft-Feel Gabardine, 50% Cot., 50% Pol. Men's Jacket with side buttoning, model Gustavo Ecru colour with Brown profile on collar and cuffs Brown pull-out buttons Immediately available for delivery: sizes from S to XL Made of Lightweight Soft-Feel Gabardine, 50% Cot., 50% Pol. Women's Pinafore, model Sabrinato be put on like a ponchoBrown with Ecru profiles a big pocket on the bottom and a pocket on the breastImmediately available for delivery: sizes S - LMade of Lightweight Soft-Feel Gabardine, 50% Cot., 50% Pol. Women's Pinafore, model Sabrinato be put on like a ponchoEcru with Brown profilesa big pocket on the bottom and a pocket on the breastImmediately available for delivery: sizes S - LMade of Lightweight Soft-Feel Gabardine, 50% Cot., 50% Pol. Apron with bib, model CesenaBrown with Ecru profilesa big pocket on the bottom and a pocket on the breastAdjustable one sizeMade of Lightweight Soft-Feel Gabardine, 50% Cot., 50% Pol. Apron with bib, model CesenaEcru with Brown profilesa big pocket on the bottom and a pocket on the breastAdjustable one sizeMade of Lightweight Soft-Feel Gabardine, 50% Cot., 50% Pol. 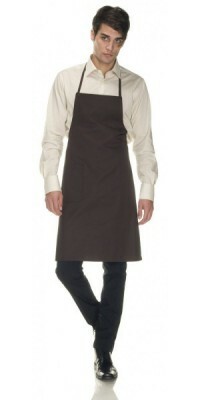 Unisex apron with bib, model Desioone pocket appliedBrown coloursize cm. 85 x 70Made of Lightweight Soft-Feel Gabardine, 50% Cot., 50% Pol. Unisex apron with bib, model Desioone pocket appliedEcru coloursize cm. 85 x 70Made of Lightweight Soft-Feel Gabardine, 50% Cot., 50% Pol.